A ductless mini-split heat pump is a compact and versatile heating and air conditioning alternative to conventional HVAC systems reliant on ducts to distribute conditioned air throughout an environment. Ductless technology is ideal for applications in which installing a conventional product would be too costly or technically difficult to be worthwhile. Are you interested in mini-split technology, but don't know what you need to get for your home? Don't worry, this buying guide can help. Ductless units rely on the same refrigeration cycle as regular air conditioners. All ductless mini-splits are electric. None need natural gas or other fuels. Unlike window air conditioners, ductless mini-splits can be very energy efficient. Overall, ductless units need a much smaller installation footprint than central HVAC units. A ductless split system air conditioner is the most basic ductless unit you can find. These are cooling-only systems. They typically feature an interior wall-mounted air handler and an outside condenser. These are lightweight, and easy for a trained professional to install. If you will only ever need cooling, a ductless a/c unit could be a great choice for your home. Ductless split system heat pumps are typically the product we recommend to customers who want a total comfort ductless solution. 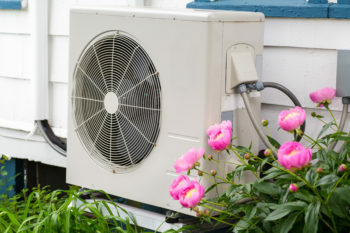 Like a ductless air conditioner, a ductless heat pump can cool, but it can also heat. That flexibility is really valuable, and typically does not increase the sales price by a large margin. Generally, ductless heat pump heating is good for early spring, late fall, and mild winter conditions. They are not designed to heat at maximum capacity below freezing or below zero. Many manufacturers sell ductless "Hyper Heat" units. These are ductless heat pumps made to optimize their cold weather heating potential. In this regard, the developers have been fairly successful in fielding a heat pump that can produce significant heat below freezing and even below zero. While a Hyper Heat ductless unit is no replacement for a traditional gas furnace in extreme cold weather regions, these are the most effective ductless heating tools available. 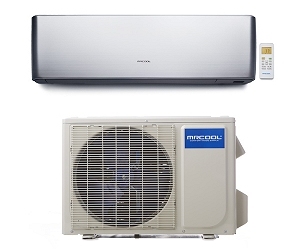 A ductless multi-zone system is a ductless heat pump that connects multiple interior air handling units to a single outside condenser. Typically, a ductless system is installed to service a single interior zone. Multi-zone systems can provide heating and cooling for up to five different interior zones. That is often sufficient to distribute conditioned air throughout an entire home of average size. While ductless condensers are all very similar in design, ductless interior air handlers are available in different shapes and sizes. The most common wall-mounted air handler is a lightweight rectangular box that hangs on an inside wall. Ceiling-mounted cassette units can be installed in ceiling spaces when desired or when wall mounting is not an option. Ceiling-mounted concealed duct units are another option for homeowners who do not find either wall-mounted air handlers or cassettes to their liking. SEER stands for Seasonal Energy Efficiency Ratio. Long story short, SEER is a measure of how efficient your heat pump or air conditioner will cool your home through a long hot summer. Just like conventional products, ductless mini-split heat pumps measure their cooling efficiency with SEER. HSPF stands for Heating Season Performance Factor. Like SEER, HSPF is a measure of efficiency. Unlike SEER, HSPF measures winter heating performance as opposed to summer cooling. The better the HSPF, the more efficiently your ductless unit will heat. The compressor is the heart of any heat pump or air conditioner. That is as true for ductless units as it is a big central a/c. Previous generation systems tended to use rotary or scroll compressors. Many of the newest ductless units use inverter compressors. Inverter compressors are definitely a superior choice, and when possible you should opt for a ductless unit that relies on one. They allow the heat pump to operate more effectively and efficiently. A blower motor is an interior air handler component. Quite simply, it is the part that blows air over a hot or cold coil to make the interior zone either hotter or colder. It's really that simple. The evaporator coil and condenser coil are two parts of the same device that allow a heat pump or air conditioner to cool, heat, or dehumidify. Most ductless coils are smaller than their conventional counterparts due to the compact size ductless applications require. Whenever possible, opt for a coil that is corrosion-resistant, since corrosion is always a major long term coil concern. The vast majority of ductless mini-splits (or conventional HVAC systems) do not have any wireless or smartphone compatibility. However, this is changing. The latest generation of ductless products allow homeowners to control their ductless units with smartphone apps. Some top-of-the-line units are even compatible with common smarthome products like Alexa, Google Assist, Nest, and others. The most common ductless lineset you will find are flared connections. Any experienced professional will find these easy to work with. The newest lineset on the market are precharged lines often sold as DIY products. These lines are precharged with refrigerant, and are usually only compatible with certain products. Just like any central air conditioner, a ductless mini-split heat pump will have an air filter or filters that it uses to keep dust, pollen, and other contaminants away from the coil. Always refer to your owner's manual, but these usually need to be cleaned regularly. Which means every month or two, and not every year or two. Ductless mini-split heat pump warranty terms and conditions can vary, so be sure to read any warranty before you buy a product. However, most ductless units come standard with a warranty that will last anywhere from 5-10 years. Sometimes you may need to register the warranty to get the full terms. You typically have 60 days to do that from the date of installation. Don't forget! Do you still have questions about ductless mini-split heat pump or air conditioner systems? Just ask us in the comments, on Facebook, or on Twitter. 2 questions- can you connect more than one blower unit to a single compressor, and what is a multi area unit? A multi-zone unit consists of a single compressor connected to multiple interior blowers. They enable you to heat or cool multiple interior zones with a single outside condenser. Smart Controllers are not included with product currently in stock, but will be included with all products manufactured in 2019. Hello engrams, how large of a hole do you have to cut inside of your house for one of these units? Also my house it's kind of upside down, the kitchen and living room etc. is upstairs and the bedroom are downstairs, where would be the best place to mount a ductless inside unit if I were to only have one? Thank you very much for your help and I look forward to doing business with you. The hole you have to cut for a mini-split is typically around 3", so quite small. The best place to mount the unit would be dependent on what areas you are trying to cool. With a two-story building, a multi-zone installation with at least one air handler on each floor would be best. You might need more than one interior head depending on space. What size heat pump mini unit do I need for a 900sq ft (floor space) attic are with sloped walls? We live in San Francisco so no extreme temperatures. For 900 sq ft, a 24k unit would be perfect. A multi-zone installation does involve the interior wall units running their own connections to the outside condenser. Here's a YouTube video that shows a typical ductless multi-zone installation. Hey Kyle...just got into my new home in North Carolina. It can get very humid here unlike where I moved from Las Vegas. So my first question, I have a 1000 sq ft garage which will be my new Woodworking shop. It has approx a celling height of 12 ft.
What size split unit do you think will do? Also I'm hearing about AC/DC, function I assume less power usage is behind that but is that a standard in all the split units out there? And last Kyle I'm seeing dehumidifier function. In my thinking any AC unit dehumidify's. What's that all about? For a 1000 sq ft, you will likely be looking at a 24k system. I don't think the DC inverter is standard on all mini-split systems, but it is becoming increasingly common. You are right in that all air conditioners dehumidify. The "dehumidifier function" on most units increases the rate of dehumidification by operating at a lower rate.